One of my favorite websites The Glow, just released their newest peek into the life of a fabulous mom. This time it was Laura Garcia and her daughter Georgiana's nursery in NYC. 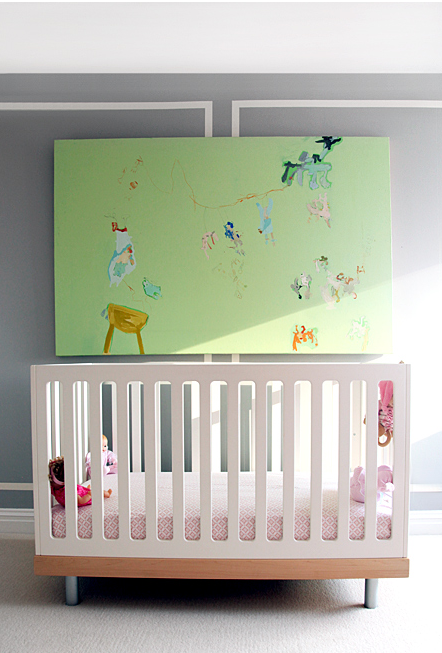 This nursery might look familiar as I wrote about it a few months ago HERE after it was featured in Vogue. This feature on The Glow gives you a more in depth look into the Laura's take on motherhood and of course more photos of the nursery. The oversized artwork popping on the muted grey wall canvas makes the room. The crib & changer are by Oeuf. And of course the photography and interview by Kelly Stuart & Violet Gaynor could not have been better. Just look at the "glow" in the shot below! Stunning! I read the article on GLOW and really loved how sophisticated the space felt. I love this nursery, I will have to check out that article. Thanks for sharing!